A snug fitting tied cap, based on the medieval “coif” generally worn under another, larger hat, this little chapeau can be worn alone or combined with a hood for a very warm feeling all over. The large stockinette front and back sections create a wonderful space for stitch patterning, colorwork, cabling, lace or embroidery. Version 1 is simpler with basic shaping providing the stitch interest. Version 2 features cables up either side of the head. Sizes: To fit head 13 (15, 17, 19, 21, 23, 25) ” / 33.3 (38.5, 43.6, 48.7, 53.8, 59, 64.1) cm. 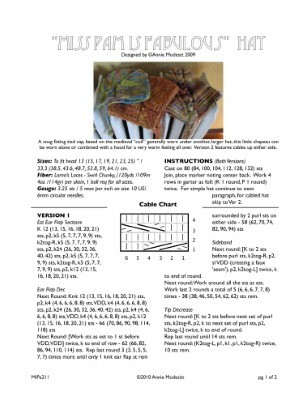 As an extra bonus, and to make the pattern 4 pages so I can sell it on Magcloud, I'm including the free Chullo pattern - enjoy!